National student leaders (left to right) Guadalupe Cortez, Adam Cavanaugh and Brooke Gatchell met with Rep. Raja Krishnamoorthi (D-Ill.) in his Capitol Hill office Sept. 25, 2018, as part of SkillsUSA’s Washington Leadership Training Institute (WLTI). 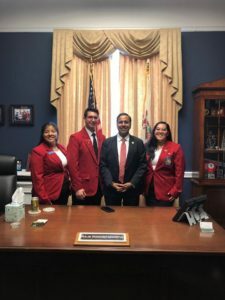 In one of more than 100 congressional visits by SkillsUSA in a single day, the students thanked Rep. Krishnamoorthi for his work on the Strengthening Career and Technical Education for the 21st Century Act, which passed both the House and Senate unanimously and was signed into law Aug. 31. Rep. Krishnamoorthi, along with Rep. Glenn Thompson (R-Pa.), was a lead co-author of the bill, which reauthorizes, reforms and modernizes the Carl D. Perkins Act, strengthening secondary and postsecondary career and technical education programs. The act is the principal source of federal funding to states for career and technical education programs across the nation. In SkillsUSA, Cavanaugh is national high-school treasurer, while Cortez and Gatchell are college/postsecondary secretary and treasurer, respectively.